AUSTIN – Prospects are good for the upcoming mule deer hunting season, which gets under way Saturday, Nov. 21 in the Texas Panhandle and Nov. 27 in the Trans Pecos. Texas Parks and Wildlife Department biologists say above average habitat conditions have bolstered body weights and antler growth this year. Also, the state agency is asking hunters and landowners to submit harvested mule deer for sampling as part of enhanced, statewide monitoring efforts for Chronic Wasting Disease. Although not required in the Panhandle, mule deer harvested in far West Texas are required to be submitted for testing under TPWD’s Chronic Wasting Disease Management Plan protocols. The plan includes mandatory check stations for susceptible species like elk and mule deer taken inside the CWD Containment Zone, which covers portions of Hudspeth, Culberson, and El Paso counties. 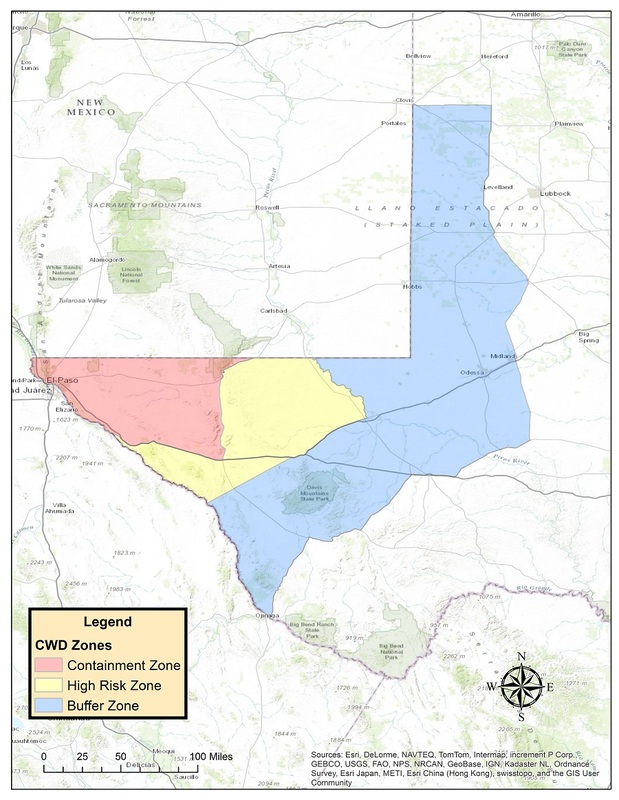 See a Texas CWD zones map on the department’s website. The Texas Animal Health Commission and TPWD will also use the CWD check stations in a cooperative effort to monitor for bovine tuberculosis (TB) in Texas. The tissue samples used for this effort would be the same samples currently collected as part of the ongoing CWD monitoring effort. Hunters taking mule deer inside the Containment Zone during the 2015-16 mule deer hunting season are required to submit their harvest (unfrozen head) for CWD sampling at a check station within 24 hours of take. Over 800 tissue samples have been collected for CWD testing purposes from hunter-harvested deer and elk from the Trans Pecos ecoregion the past three hunting seasons, and CWD has not been detected in mule deer located outside of the Hueco Mountain area. Mandatory check stations will be open from 9 a.m. to 9 p.m. Nov. 27 – Dec. 13 and 9 a.m. to 7 p.m. on Dec 14. Stations will be located in Cornudas at May’s Café (on US 62-180) and in Van Horn at the Van Horn Convention Center (1801 West Broadway). Deer and elk harvested in other areas of the Trans Pecos and Panhandle regions may present their deer for CWD testing, to aid in statewide surveillance effort to contain the disease. A voluntary check station will be established at the Hip-O Taxidermy in Alpine (east side of town on US 90, across from Dairy Queen) during the first three weekends of the general season, Saturday through Monday (Nov. 28–30, Dec. 5–7, and Dec. 12–14), from 9 a.m. – 5 p.m. Saturday and Sunday and 9 a.m. – 1 p.m. Monday. Other check station locations are illustrated on a map shown on TPWD’s main CWD web page.